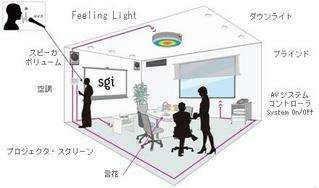 SGI Japan has unveiled an intelligent room system, called RoomRender, that can control the electronics, appliances and hardware in a room based on the spoken commands and emotions of the room's occupants. The company installed the RoomRender system in one of its Tokyo office meeting rooms on December 5. With the cost of RoomRender's basic components estimated at between 5 and 6 million yen ($40K to $50K), the company initially hopes to see the system put to use in company meeting rooms, homes, hotels, hospitals and care facilities. RoomRender relies on AmiVoice voice recognition technology (developed by Advanced Media) to recognize and analyze spoken commands, enabling the room to close the blinds, turn on the heater, etc. as instructed. When linked with a home entertainment system, RoomRender can be instructed to record TV shows. At present, RoomRender does not have the ability to learn the routines and preferences of its inhabitants, so it has to be told specifically what and when to record, but perhaps one day when RoomRender can predict your behavior, you won't have to tell it to record your favorite show -- it'll just know. RoomRender also includes features that respond to the mood of its occupants. FeelingWall � a wall whose colored lights change according to the mood of the people in the room � relies on Sensibility Technology (developed by SGI and AGI), the same technology used in KOTOHANA, which was developed by SGI Japan and NEC. Like KOTOHANA, FeelingWall interprets emotions based on the intonation and rhythm of voices, adjusting the color and lighting accordingly. RoomRender can also be programmed to control an aroma diffuser, releasing fragrances that correspond to various moods. Features like these mean that if an inhabitant sighs �I�m tired,� the room can automatically respond by dimming the lights, causing the light of the FeelingWall to pulsate gently, turning on some relaxing background music and emitting a soothing fragrance from the aroma diffuser. SGI, which recently became Segway's official distributor in Japan, is also developing a function that enables RoomRender to control the two-wheeled transportation devices. In the future, RoomRender will be able to send a Segway to an occupant that asks for it, and it will return a Segway to its battery charger when the power starts running low. Unfortunately, this also means you won't be able to use the Segway as an escape vehicle if your relationship with RoomRender suddenly turns sour. The use of fragrances and aromatherapy is startlingly reminiscent of Aldous Huxley. (Remember those "fragrance taps"?) At any rate, the impact could be wide-ranging. At some point, RoomRender technology could even be part of the penal system--provided governments wanted to spend the money. I was thinking of The Machine in E.M. Foster's The Machine Stops. Although, we are way past pneumatic post. I found your site via google. Very intressant I will continue to look around.